There are at least 20 different species of cockroaches in Arizona, probably about 10 are native and rarely encountered in the urban environment. Those established in urban areas include: the American, brown-banded, field, German, Oriental, Surinam and Turkestan. Most cockroaches are tropical or subtropical in origin and generally live outdoors. However, some species have adapted well to living with humans. Though it is true that they prosper in clutter, filth and grime, cockroaches at times infest even the most sanitary and well-organized homes and buildings. Cockroaches enter buildings in infested boxes, grocery bags, beverage cartons, furniture and dried pet foods. They also enter around loose-fitting doors and windows, where electrical lines or water and steam pipes pass through walls, in seasoned firewood and through sewer lines. Most cockroaches are nocturnal and appear during daylight only when disturbed or where there is a heavy infestation. They prefer warm, dark, humid shelters and often move around the kitchen sink or drain board. They prefer to rest in cracks around, under or inside cupboards and cabinets; where pipes or electrical wiring pass along or through a wall; behind window or door frames, loose baseboards or molding strips; under tables and chairs; in upholstered furniture; in bathrooms; in radio and TV cabinets; and in motor compartments of refrigerators, washing machines and other appliances. It is important to know where cockroaches are hiding in your home because these are the locations that must be cleaned. Cockroaches feed on a variety of plant and animal products, including meat and grease, starchy foods, sweets, baked goods and other unprotected kitchen goods. They also feed on materials such as leather, wallpaper paste and book binding. Cockroaches rank high on the homeowners’ list of pest problems. Cockroaches contaminate food with excrement and salivary secretions and they may leave an unpleasant odor. Cockroaches also cause respiratory problems to individuals sensitive to the allergens they produce. Outside of homes and buildings, cockroaches play an important role decomposing vegetable and animal materials. The American cockroach is the largest and most frequently encountered common species, growing to a length of 1-1/2 to 2 inches. This species is also referred to as the sewer roach. It is reddish-brown with a light-yellow band around the edge of the head shield. Adults of both sexes have well-developed wings, but seldom fly. They are, however, capable of gliding flights. Nymphal cockroaches are smaller than adults, grayish-brown in color and less-fully winged. The adult female usually drops her egg capsule within a day after it is formed. She often places the capsule near a food or water source or in a location where it can be covered with miscellaneous debris. Occasionally, she glues the capsule to some surface with secretions from her mouth. The capsule may be deposited outdoors in moist wood, in cracks in bark or in whorls of plants. In the warm climate of Arizona, American cockroaches often live out of doors in alleys, lawns, decayed trees and plants. They often enter and thrive in homes, commercial establishments and other buildings that provide favorable shelter and an ample food supply. They live mainly in dark, moist sites in kitchens, bathrooms, basements and steam tunnels, sewers and even in crawl spaces under buildings. The adult German cockroach is light brown and 1/2- to 5/8-inch long. The head shield has two dark stripes that run lengthwise. Adults are fully winged but rarely fly. Nymphal German cockroaches are smaller and darker than adults and are wingless. The German cockroach is normally found indoors and is more active than other domestic species. The German cockroach produces more eggs per capsule than most other species and has a developmental period as short as 2 months. Thus, troublesome infestations can develop rapidly from a few individuals. This is the only domestic species in which adult females carry egg capsules protruding from their abdomens until the eggs are ready to hatch. In fact, few eggs will hatch if the capsule is detached from the female more than a day or two before hatching would normally take place. These cockroaches thrive in all types of buildings, but are found most often in homes, apartments, condominiums and commercial-food establishments. They usually enter tightly constructed homes with bottled drink containers, potatoes, onions, dried pet foods, grocery sacks, corrugated cartons and even furniture. German cockroaches usually seek dark shelters near moisture and food, such as in kitchens and bathrooms. However, when populations become large and food scarce, they appear in bedrooms and other less-likely places. The Turkestan cockroach was first found in Arizona in 1982 and is common in the Phoenix and Tucson areas. Adults are about 1-inch long. The male has long, yellowish-tan wings. The female has short, rounded wings with creamy stripes along the edges and a pear-shaped body. 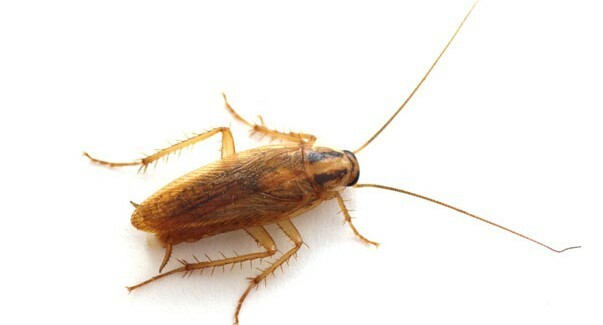 This roach is typically found outdoors, but when it reaches peak populations in June, can be found indoors. Male roaches are attracted to lights on warm summer nights. If doors and/or windows are not well sealed, roaches can, and often do, gain entrance into dwellings. Indoor and outdoor sanitation practices around the home can discourage cockroaches. Clean kitchen scraps from visible areas as well as behind and inside appliances and cabinets. Compost piles should be as far away from the home as is practical. Woodpiles, potted plants and leaf litter can also harbor roach populations. Cricket Management There is no single, perfect solution for the management of crickets, but a combination of the following suggestions will help to reduce populations. First determine if there are enough crickets currently present or damage apparent to warrant management; everyone has a different tolerance and only you can determine how many crickets are “too many”. Vacuum up cricket frass (poop), and monitor how rapidly it accumulates in corners and sheltered areas outside. This will allow you to assess the current populations. The single most effective step is to improve the level of pest proofing in the building. Information is available at http://ag.arizona.edu/pubs/insects/az1320.pdf. Cultural strategies: Reduce food supply. Keep floors clean – esp. corners, and under shelving! Pick up and seal pet food after dark. Limit the use of night-time lighting, or change bulbs to yellow “bug bulbs” which do not attract bugs. Remove un-kept vegetation and debris from around buildings; it can serve as a hiding place or breeding site. Mechanical strategies: Prevent entry by sealing cracks and openings. Use sealant and weather-stripping to fill all openings, cracks, gaps, and holes in foundation, siding, windows, doors, screens, and other possible entry points. Think like a bug! Remove crickets from indoors by squashing, vacuuming or using sticky monitoring traps. Apply diatomaceous earth (DE) or boric acid in cracks and crevices that cannot be filled; this is where crickets hide during the day. DE is an abrasive, fine, white powder which is actually tiny sharp fossil shells that will gradually wear through the cricket's outer cuticle, causing it to dehydrate and die. Many products can be used both indoors and outside. Inhalation of DE could lead to respiratory problems; wear a dust mask during application. Biological strategies: Encourage natural predators around the school or home (lizards, birds, spiders). Avoiding broad spectrum pesticide applications goes a long way to promote natural predators and a wide diversity of creatures. Ovipositor (females only) Abdomen Thorax Head & antennae D. H. Gouge, C. Olson, (University of Arizona); M. Rehm-Bowler, N. Enriquez, J. M. Rodriguez (AZ Dept. Environmental Quality). Integrated Pest Management Techniques for Crickets - 2 - GENERAL HABITS Crickets are active at night. They enter buildings more often during a wet, warm season and/or when the weather turns cool in the fall. Females have ovipositors, which distinguishes them from males (who only have two short cerci and no ovipositor). Crickets commonly enter buildings through open doors or those that need to be pest-proofed (door sweeps, weather seals, and screens).